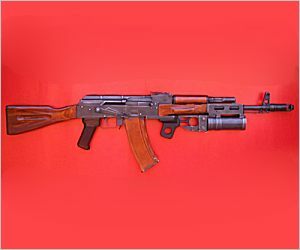 The 40-mm GP-25 underbarrel grenade launcher is an issue weapon of the Soviet/Russian Army. It is also used by Special Forces including SPETSNAZ of the Federal Security Service (former KGB) and Ministry of Justice, OMON and Groups of Rapid Deployment of the Ministry of Interior. In the military slang, GR-25 is sometimes referred to as "small artillery" indicating its firepower and effectiveness. It's U.S. Counterpart is the M-203 Under Barrel Grenade Launcher. Intended to defeat manpower located in the open, in trenches and on reverse slopes of the terrain by flat and curved fire with the use of VOG-25 and VOG-25P fragmentation rounds at ranges from 50 to 400 meters. According to SPETSNAZ, GP-25 is indispensable also in a variety of operations like "Dynamic Entry" or "Territory Clearing". The fitting of assault rifles with the under-barrel grenade launcher makes it possible to effectively engage targets covered from small arms fire. The under-barrel grenade launchers are provided with a double-action firing mechanism and an open iron sight which allows corrections for grenade drift and is rigidly installed on the left wall of the bracket. The grenade launcher can fire non-lethal rounds to suppress mass disturbances and arrest law offenders. The grenade launcher fits readily to the full-sized assault rifles AKM, AKMS, AK74, AK74M, AK101, AK103 and AN-94. No adjustments are required.